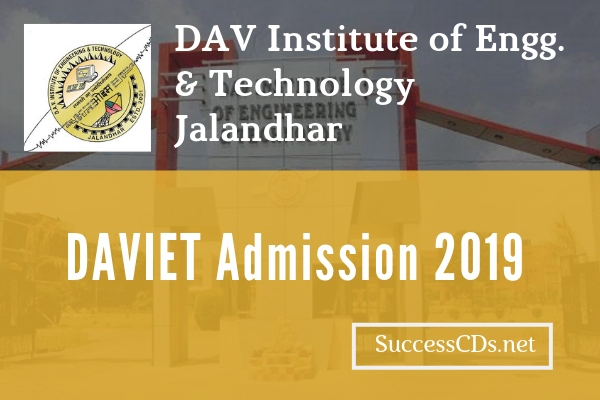 DAVIET Jalandhar Admission 2019 - DAV Institute of Engineering and Technology (DAVIET) Jalandhar invites application for the registration for admission into B.Tech , M. Tech , MBA , MCA , BBA and BCA Program for the academic session 2019. Two year certificate course from SLIET, Longowal. Admission will be made on the basis of Rank of JEE (Main). 85% seats shall be open for the candidates within the state and 15% will be open for the candidates from outside the state. B.Sc. degree from a recognized university as defined by UGC, with at least 45% marks (40% in case of reserved category) and passed 10+2 with mathematics as a subject. Admission will be made on the basis of inter-se-merit in the qualifying examination. The resultant vacant seats of first year of B. Tech. of session 2018-19 shall also be filled on the basis of inter-se-merit. Pass in +2 examinations from a recognized board or equivalent or passed three year diploma in any trade from Punjab State Board of Technical Education & Industrial Training, Chandigarh or such examination from any other recognized State Board of Technical Education, or Sant Longowal Institute of Engineering & Technology, Longowal. Admission to BBA will be based on merit of qualifying examination. BE/B.Tech. with at least 50% marks in aggregate (45% in case of reserved category) with a Valid GATE score. Admission to M. Tech. course both for 85% category and 15% category shall be made strictly on the basis of valid GATE score for 2018-19 and in case seats haven’t been filled under respective categories admission shall be considered on the basis of inter-se-merit in the qualifying examination. Bachelor’s degree of minimum three years duration in any discipline from university recognized by UGC. Admission to MBA course both for 85% category and 15% category shall be made on the basis of valid rank in CMAT conducted by AICTE, New Delhi. In case seats are not being filled under respective categories, admission may be considered on the basis of inter se merit in qualifying examination. Bachelor’s degree of minimum three years duration from a university recognized by UGC. Admission to MCA course both for 85% category and 15% category shall be made strictly on the basis of inter-se-merit in the qualifying examination. B.Sc. (IT/Computer Science) with mathematics as a course at 10+2 level or at graduate level with at least 50% marks (45% in case of reserved category) in the qualifying examination. Admission to MCA 2nd year direct shall be made strictly on the basis of inter-se-merit in the qualifying examination. After completing the form online, you can take a print out of the filled-in form. You are advised to retain one copy of the filled-in form for future reference. You are not required to send this form by post.